Top > Study > Virtual currency > Who issue Bitcoin? It is the reality that Bitcoin doesn't have a manager (an operator). Actually the system is such that all the users can issue Bitcoin. business information of Bitcoin is exhibited basically. And an individual examine whether that business is right, and get Bitcoin as considerations. ▲It becomes like this when I exhibit that system roughly. Actually it works by more complicated mechanism. 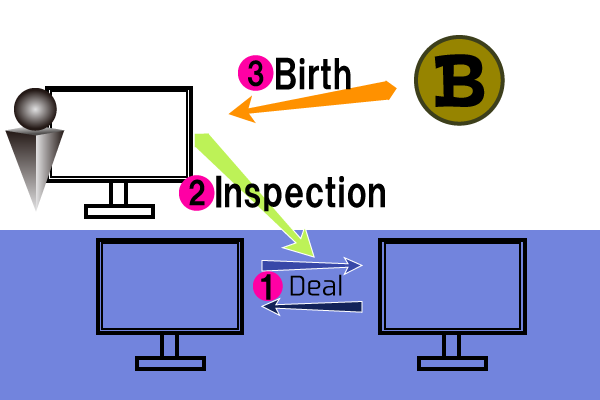 Bitcoin that get as considerations are not things as work's salaries. These turns out at that time. When Bitcoin developed, made it newly instead of examine the business, and give the people who examine the business. So means of getting Bitcoin is called “Mining”. It compared that we mined minerals etc. It nicely express alike point between Bitcoin and minerals that someone do mining(issue) otherwise minerals(Bitcoin) isn't in the world. That is to say, Bitcoin isn't making if no people for examine. However formation this system because always exist people who want to Bitcoin unless it becomes worthless. The simplicity that we can mining it even from our home becomes the reason of that system turns well.